Oh what a night! 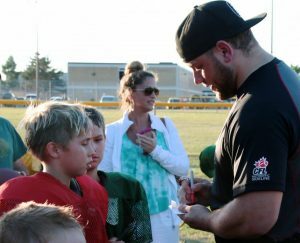 REDBLACKS Guest Coach! 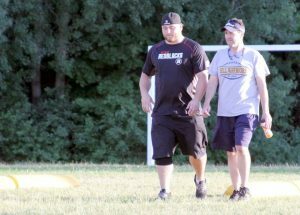 This was the second straight year, Zack Evans took his personal time to volunteer to Guest Coach for our Warriors. He proudly tweeted, “Grateful to get the opportunity to coach the @BellWarriors1 and impart some knowledge in our youth @REDBLACKS @CFL“. The big man is clearly a CLASS ACT! REDDBLACKS DL Zack Evans making a real difference with our young Warriors players! Warriors Mosquito WR Coach Normand Fortier was the key organizer of the event. KEEP UP THE GOOD WORK NORM! 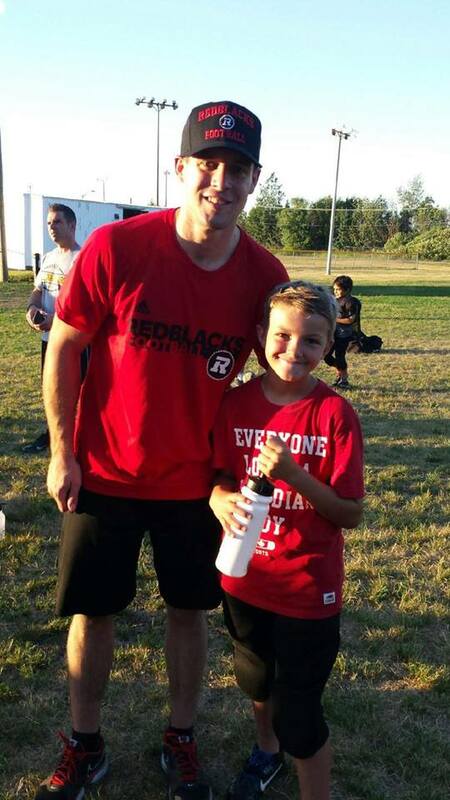 1st Year REDBLACKS starting WR Jake Harty, a product of the Calgary Dinos, makes one of our young standouts Nolan Dulmage’s day. THANKS JAKE!! $32,000 and Counting. Deadline August 1st. 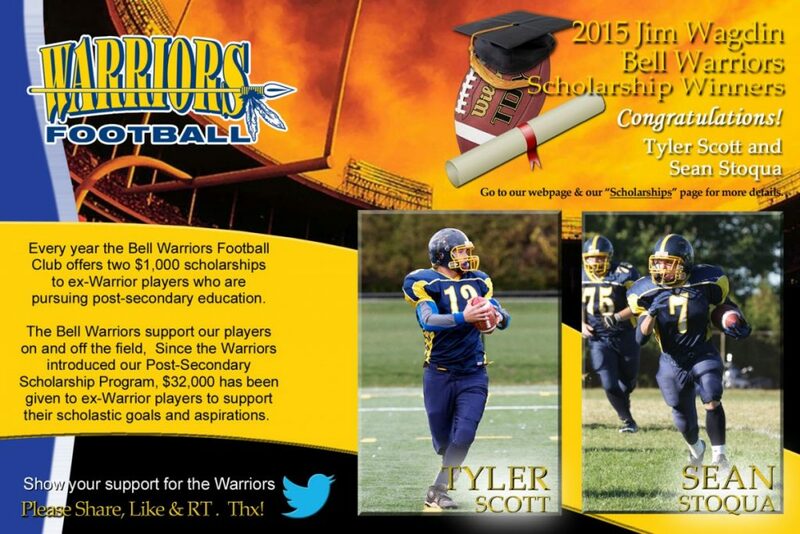 The Bell Warriors Jim Wagdin Scholarship Program offers two $1,000 scholarships to ex-Warriors who are pursuing post secondary education. Participation in a post secondary football program is not a pre-requisite. There are however, three selection criteria – Academics, Warrior Experience, and Community Involvement. Applications must be submitted by August 1 and must include an original letter describing both the applicant’s experiences with the Warriors as well as his/her volunteer involvement with the community, a transcript of the applicant’s previous year’s marks, a notice of acceptance from the selected university/college (for first year students) OR a note from the school indicating the applicant’s return for a succeeding year, as well as any letters of reference. (ii) An insufficient number of eligible applications are received prior to the deadline. More details can be found on our Scholarship Page. Good Luck! Tonight’s (Monday, June 20th) Pee Wee practice is cancelled due to severe heat. See you Wednesday, June 22 at our next Pee Wee tryout. Super door prizes, a great meal & relaxing day golfing with friends, family & our Warriors. Open to anyone. This is a major fundraiser for the club so the more the merrier but on a first-come-first-serve basis. We’ll be looking for Hole Sponsorship opportunities that will also qualify you as a FRIEND OF THE WARRIORS SPONSOR. 100% of monies raised go to support player fees. Tickets will be available from your team manager. $80 per player or $60 for Warrior players. We are looking for local businesses to donate prizes. Contact Tim Sheahan at 613-825-4137 or email asheaha181@rogers.com for more details. Don’t Miss Out! The Bell Warriors are going to see the Edmonton Eskimos take on our REDBLACKS at a very special price of only $32 a savings of 20% off of the ticket price!!!! This is also a MAJOR FUNDRAISER for the Warriors. • Email info@bellwarriors.ca if you have any questions. It’s a WIN-WIN-WIN and it will be a great night. DON’T MISS OUT!! !